Σας προτείνουμε να πάτε με το Steven για να εξερευνήσετε τις φυσικές ομορφιές του όρους Δίρφυς. Θα σας καθοδηγήσει στα μονοπάτια που γνωρίζει πολύ καλά και θα σας δώσει την ευκαιρία να ανακαλύψετε ένα από τα πιο μαγευτικά βουνά της Ελλάδας. Αν σας ενδιαφέρει η αρχαιολογία, σας προτείνουμε στη συνέχεια το μονοπάτι (Trail4) που θα σας οδηγήσει μέσα από την Ερέτρια για να καταλήξετε στην Ακρόπολη της Ερέτριας. Κατά μήκος της διαδρομής η πόλη της Ερέτριας διαθέτει πλούσια ιστορία και μνημεία με στάση οπωσδήποτε στο αρχαίο θέατρο, το μουσείο της Ερέτριας και την Οικία των Ψηφιδωτών. From Steni village guests will head towards the chestnut forest; with final destination the Climbing Club of Chalkida refuge – Magnificent views of mount Dirfys. The path back to Steni is from an alternate route through wonderful rocky trails which turn into great forests. This is a days’ walk you will really enjoy! 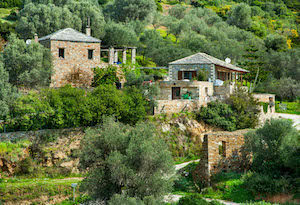 A mostly gentle route; it allows visitors to enjoy Central Evia main mountain ranges of Dirfys & Xerovouni. Steep hills and amazing views will describe your walk. Guests will encounter and admire a wide variety of birds and flowers. Start off point, Steni Village; heading on towards Xerovouni Mountain. The trail is uphill and guests will cross a stream several times. Guests may return from this point or continue (Hard route) their ascent and head towards Kampia village. The route offers eye-catching views and the scenery from the top is breathtaking. At Kampia village guests may taste local fresh trout. This is not a circular route so you need to be picked up. Agali Gorge is a remarkable gorge! Located at the foot of mount Dirfys in Evia, the trail starts near Agios Athanasius village where the ascent starts in the Agali gorge, continuing west round Mount Dirfys. The scenery is daunting and will leave you satisfied once you get to the mountain refuge. 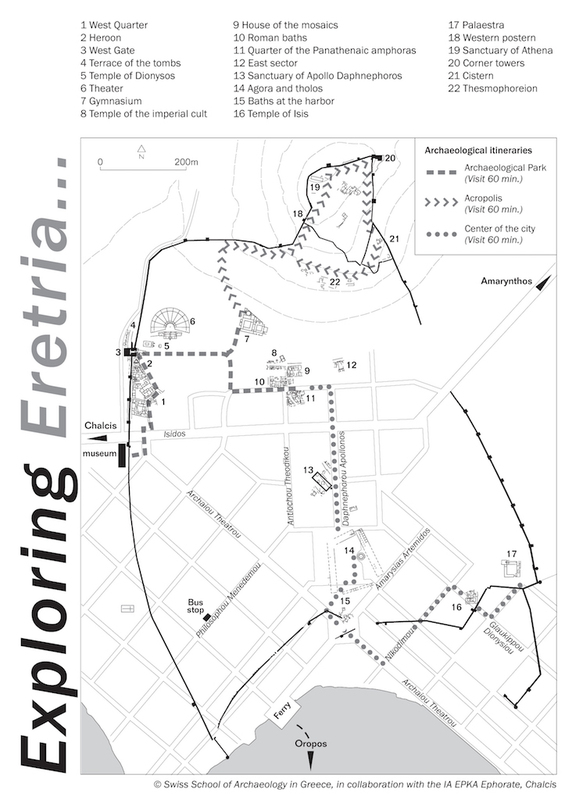 The hike towards the Acropolis of Eretria will lead us to the top of the hill, where the town of Eretria used to be in the Middle Helladic period (2000-1600 BC). It is a site of great importance just a short walking distance from the city centre. The first evidence for human activity in the area of Eretria are pottery shards and stone artifacts from the late Neolithic period (3500-3000 BC) found on the acropolis as well as in the plain. The oldest archaeological finds date the foundation of the city to the 9th century BC. 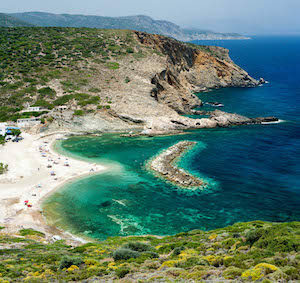 It was probably founded as the harbor of Lefkandi, which is located 15 km to the west. The name comes from the Greek ἐρέτης, erétēs, rower, and the verb ἐρέσσειν/ἐρέττειν, eréssein/eréttein, to row, which makes Eretria the «City of the Rowers». The earliest surviving mention of Eretria was by Homer (Iliad 2.537), who listed Eretria as one of the Greek cities which sent ships to the Trojan War. The most impressive monument of ancient Eretria, one of the oldest known theatres, lies in the western section of town, between the western gate, the stadium and the upper gymnasium; the temple of Dionysus was found at its south-west end. The Archaeological Museum of Eretria, which is located adjacent to the archaeological site of Eretria. Many artifacts found at Eretria though are on display at the National Archaeological Museum in Athens and in the Louvre in Paris. The exhibits cover all the periods of antiquity and derive from the wider region. Among the most important are the finds from the protogeometric cemeteries of Lefkandi and Eretria and the sculptures from the temple of Apollo Daphnephoros. This splendid House with the mosaics was built in ca. 370 B.C. and remained in use for about a century. It is distinguished by its floors, covered with elegant pebble mosaics representing mythological scenes: Nereid’s on the back of a seahorse, legendary battles between Arimaspians and griffins, sphinxes and panthers. Early departure forZarakes; the hikebegins at theold village ofZarakes, also called Machalaswhich isthe historicheartof the village. Return to the resort in the afternoon. For more information please contact the reception.